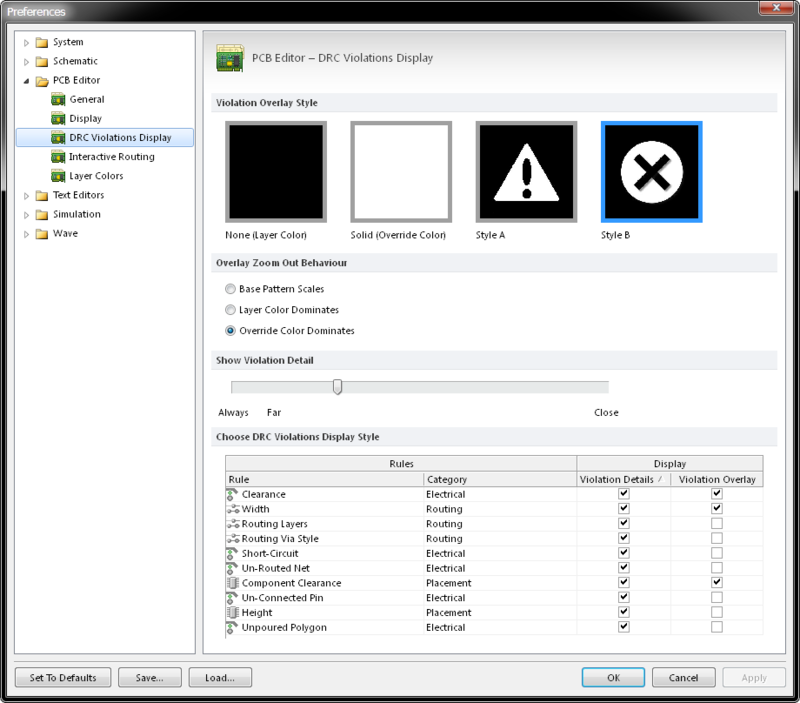 The PCB Editor - DRC Violations Display page of the Preferences dialog. Te PCB Editor – DRC Violations Display page of the Preferences dialog provides a range of controls that determine the visual functionality of the DRC Violations Display feature within the PCB workspace. The PCB Editor – DRC Violations Display page is part of the main Preferences dialog (File | ) and is accessed by clicking the DRC Violations Display entry under the PCB Editor folder, in the left hand pane of the dialog. Select the visual overlay style to specify how violations appear in the PCB workspace. The example images in the table below illustrate the result of a Width Rule violation for routed track on the Top Layer. The DRC override color is used, totally overriding the default layer color. (See note below). The DRC override color is used in the display of an exclamation-type pattern, leaving the default layer color also visible. The DRC override color is used in the display of a cross-type pattern, leaving the default layer color also visible. (This is the default override pattern). The override color (the color associated with the display of a violation overlay) is that defined for the DRC Error Markers system color, on the Board Layers and Colors tab of the View Configurations dialog.. These options determine how the overlay displays when you zoom out. For example, you can elect to have the override color become more dominant the further you zoom out, until the layer color is not noticeable, and vice-versa. Play with the options available to find the setting that best suits your needs and working preference. This option determines the zoom point at which the custom violation graphics for a violated design rule will be displayed. Setting the slider bar more towards Close will result in the violation details appearing when you are more 'zoomed in'. Conversely, to keep the details visible while zooming out to a greater extent, set the slider bar more towards Far. To keep the violation details displayed, irrespective of zoom level, set the slider bar to Always. Experiment with the Violation Detail slider and Zoom Out Behavior settings for the most suitable DRC Violation display. This region presents a grid allowing you to choose the display style used, on a per-rule basis. Enabling the Violation Details field for a rule type will use the associated custom violation graphics to display the DRC violations of that rule. Enabling the Violation Overlay field will display the violations using the specified overlay style. Using the two display types together can prove useful in terms of providing a 'coarse' and 'fine' indication of violations. When zoomed out, the overlay can flag where a violation exists, then zoom in to view the detail delivered by the associated custom violation graphic. Right-click on a Rule type for a context menu to quickly enable or disable use of a violation display type for all rule types. You can also quickly enable the display of violations – detailed graphics or overlay styles – for only those rules currently being used in the design. Use the grid and related commands to set up exactly how DRC violations will be displayed in the workspace. By default, the Violation Details display option is enabled for all rule types and the Violation Overlay display option is enabled only for Clearance, Width and Component Clearance rules. Using the two display types together can prove useful in terms of providing a 'coarse' and 'fine' indication of violations. When zoomed out, the violation overlay can flag where a violation exists, then zoom in to view the detail delivered by the associated custom violation graphic.